These days we are increasingly aware of the factors which affect honeybees and their survival. Some of these may be more obvious than others, having always influenced our bees such as, seasonal changes in weather patterns, and nectar and pollen flows whereas others may be more recent, such as land use intensification and the arrival of varroa. These factors may act independently or in combination with each other, both inside and outside of the hive. 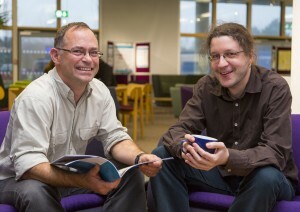 It was with this in mind that a group of scientists, led by Professor Juliet Osborne from the Environmental and Sustainability Institute, University of Exeter, brought together existing research and data on honeybees to develop BEEHAVE, a computer model which simulates the life of a honeybee colony. BEEHAVE not only provides a useful tool for scientific research, but is also a valuable educational and exploratory tool for beekeepers, whether it’s looking at optimum apiary locations for honey production, or the influence of a wet summer on over winter survival. BEEHAVE’s user friendly interface is able to model bees collecting food in a realistic landscape, under real weather conditions and is the first of its kind to combine foraging with colony dynamics, population dynamics of varroa mites, and the epidemiology of their associated viruses. Environmental conditions can be easily changed to a number of pre-set ones which are based on real data or they can be modified specifically, under more advanced features of BEEHAVE, so that the landscape and weather are comparable to those at a beekeepers’ own hives. 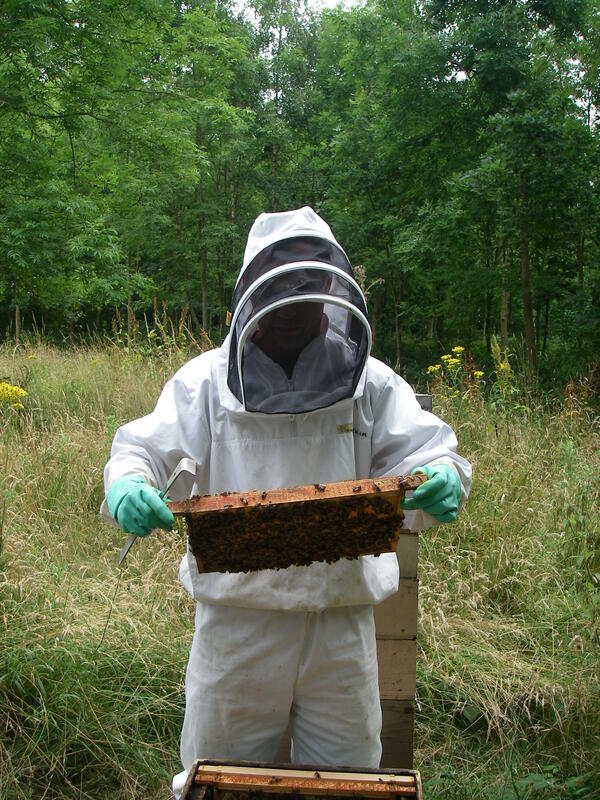 BEEHAVE also includes a range of beekeeping practices such as supplementary feeding, merging of weak colonies, honey harvesting, and treatment for varroa which can be tailored to an individual’s preferences. These inputs can be examined independently or in combination with each other. So the influence of changes in beekeeping practices can be explored in the safety of working with a ‘virtual’ colony of bees. Live updating graphs show important aspects of colony status, foraging, and varroa which can be individually modified to show resulting outputs of most interest, e.g. egg-laying rate, in-hive honey and pollen stores, or varroa drop rates. These can be explored by following the changes from one day to the next, or over several years. Next year’s British Beekeepers’ Association Spring Convention will feature a workshop on BEEHAVE. The session will introduce the model with a virtual ‘driving lesson’, and show how it can be customised to meet individuals’ needs to explore the effects of different beekeeping practices on colony success and survival. The workshop will be led by Dr Matthias Becher, Dr Pete Kennedy and colleagues. Please look out for details of the workshop in the forthcoming Spring Convention programme. Of course, sustaining honeybee colonies is vital not only for honey production and beekeepers’ livelihoods, but also due to their contribution to the pollination of crops and wild plants. However, understanding the factors which are thought to increase colony mortality can be complex and immensely time- and resource-consuming. This is because factors such as varroa mites, varroa-transmitted diseases, food availability, and pesticides often have complex feedback mechanisms which need to be taken into account. While traditional research methods are important for new discoveries, computer models such as BEEHAVE have the advantage of allowing a variety of environmental conditions to be tested in a safe, fast, and cost effective way to help identify combinations of factors likely to be involved in colony declines and therefore give us a set of priorities for further testing. For example, the provision of flower patches close (e.g. 500m) to a hive for a large part of the flowering season is critical to maintaining healthy colonies, as a lack of forage over sustained periods leaves the bees vulnerable to pressures from varroa mites, disease and pesticides. Addressing food availability is therefore vital for ensuring healthy colonies over time. BEEHAVE has the potential to inform policy makers and research scientists investigating the reported declines in European honeybees and can be used to identify the best course of action for improving honeybee health. For example, there is much interest in developing the model to investigate the consequences of different pesticide applications, as part of academic research and for risk assessment. A recent workshop at the University of Exeter saw policy makers, research scientists, and beekeepers explore BEEHAVE for the first time. The day proved very successful and discussions were started as to how BEEHAVE can be used in the development of new approaches to bee management, pesticide risk assessment, and land management. Of course, BEEHAVE has its limitations. Like all computer models, it is a compromise between how realistically a colony can be modelled and the computational efficiencyneeded to do it. For example, density of colonies, drifting, and competition between colonies are not currently in the model. If they were added to the current version, they would likely result in the model running very slowly and becoming impractical, but they could be considered in future versions. . There is an urgent need to provide biologically realistic predictions of honeybee colony dynamics, growth and survival, as healthy bees are vital to our food supply and livelihoods. BEEHAVE is ready to do this and can be used to tackle basic and applied questions regarding honeybee health. If you would like to try it for yourself, then BEEHAVE is freely available http://beehave-model.net/. You can also ‘Like’ BEEHAVE on Facebook (facebook.com/BeehaveModel) and join the Facebook group “Beehavers” (https://www.facebook.com/groups/635012383219568/) to keep updated. Tickets for the BBKA Spring Convention can be purchased here. The BEEHAVE project was funded by an Industrial Partnership Award from BBSRC with co-funding from Syngenta, and is currently benefiting from a NERC funded Impact Accelerator Award. It involved collaboration between ecologists and modellers from Exeter (Professor Osborne, Dr Becher and Dr Kennedy), Helmholtz Centre for Environmental Research – UFZ Leipzig (Professor Grimm and Ms Horn) and Syngenta (Dr Thorbek). The paper ‘BEEHAVE: a systems model of honeybee colony dynamics and foraging to explore multifactorial causes of colony failure’ is available here.